WW1 Officers paperwork - and now WW2 AB439. Last edited by Lord Byron on Sat Feb 01, 2014 5:02 pm, edited 1 time in total. "If I am a fool it is, at least, a doubting one; and I envy no-one the certainty of his self-approved wisdom". Nice! I shall keep an eye out for those as a present for the other half. And we are reproducing lots of nice, authentic crates, tins and labels! Miss Costello wrote: Nice! I shall keep an eye out for those as a present for the other half. If you want and AB439 Kate, of the 12 I made 6 are already reserved... unlikely to make more of these, so if you want one get one while you can. I am very interested in these for my Lincolnshire Regiment set up. Any chance you could let me know the details, it is bits like this that make a portrayal that bit better. abaddon1974 wrote: Any chance you could let me know the details, it is bits like this that make a portrayal that bit better. 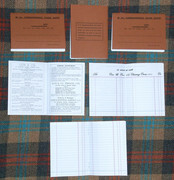 A set is £40 (£20 for AB439, £12 for accounts book, £8 for cheque book), plus £4.00 for UK 1st Class P+P. PM me for address, etc. Last edited by Lord Byron on Mon Jan 07, 2013 7:23 pm, edited 1 time in total. Those were the details I wanted, will send a pm for the address. An update on the cheque book front (slight irony intended). Miss Costello wrote: Why the irony? Because the original RAF cheque book had them as the front cover, and my use of front linking an aspect of discussion with the actual front of the cheque book. Anyhow, I posted off some of the sets today, and discovered (as usual ) the Post Office somehow managed to under-estimate the postage. So for anyone who already put their name forward I'm not changing the cost from £2.50, but for any new orders it will be £4.00 instead. abaddon1974 wrote: Those were the details I wanted, will send a pm for the address. Craig, received your cheque today and got your set posted this afternoon, so should be with you either tomorrow or Wednesday. First feedback in from an Officer in the 10th Essex - "so good I don't want to mess it up by filling it in!" That will be my package that I have to pick up from the post office. I look forward to collecting it. Received my items yesterday thanks. Everything arrived safely and looks great. abaddon1974 wrote: Received my items yesterday thanks. Everything arrived safely and looks great. Excellent, glad you're happy Craig . Currently holding off on offering the sets with cheques at the moment due to printer problems, persevering over the weekend still. Lord Byron wrote: Currently holding off on offering the sets with cheques at the moment due to printer problems, persevering over the weekend still. Printer problems now resolved, will have several crisp new sets in the next couple of days. 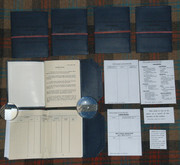 Back due to popular demand, I have been busy making up new and improved sets of my officers WW1 paperwork sets. These comprise of the AB439 Officer's Record of Services, an account book for the bank Cox & Co, and a cheque book for the same. 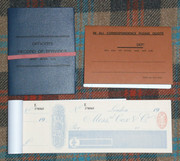 A complete set is £50 plus P+P, the components on their own are £30 for the AB439, £15 for the accounts book, and £15 for the cheque book (not including P+P). Buy now before the silly season of 2014 comes around! Re: WW1 Officers paperwork - and now WW2 AB439.